Constructional difficulty: Easy to moderate. Some simple setting up required. This is a voltage controlled amplifier module inspired in part by a classic vintage design. The Oakley Classic VCA is based on the ARP4019 sub-module which was used on the wooden case ARP2600P semi-modular synthesiser. The design has a fully discrete core but uses op-amps for input summing and the output drivers. 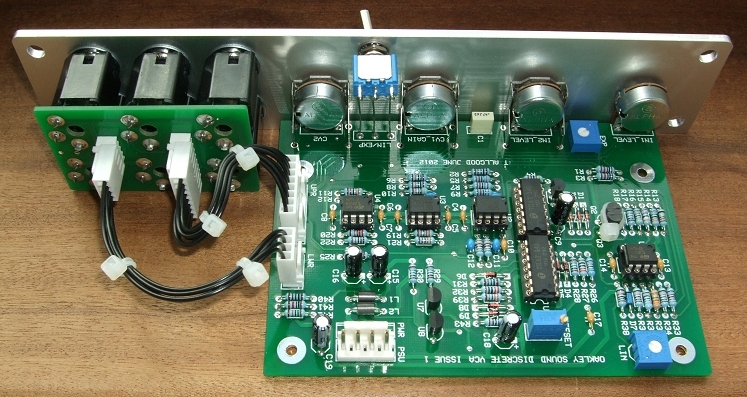 Power (+/-15V) is provided to the board either by our standard Oakley 4-way header or Synthesizers.com header. Current consumption is approximately 35mA per rail. The main PCB is 89mm (deep) x 126mm (height). As with all Oakley projects both PCBs are double sided with through plated holes, have tough solder mask both sides, and have bold component legending for ease of construction. The prototype Classic VCA module using a natural finish Scheaffer panel. Note the use of the optional Sock6 socket board to help keep the wiring to the sockets neat and tidy . Last revised: August 21, 2017.